ITALY PART I: Linguini Franca. (ITALY PART II is a trip report about destinations from this trip – contact me to plan a trip like this). 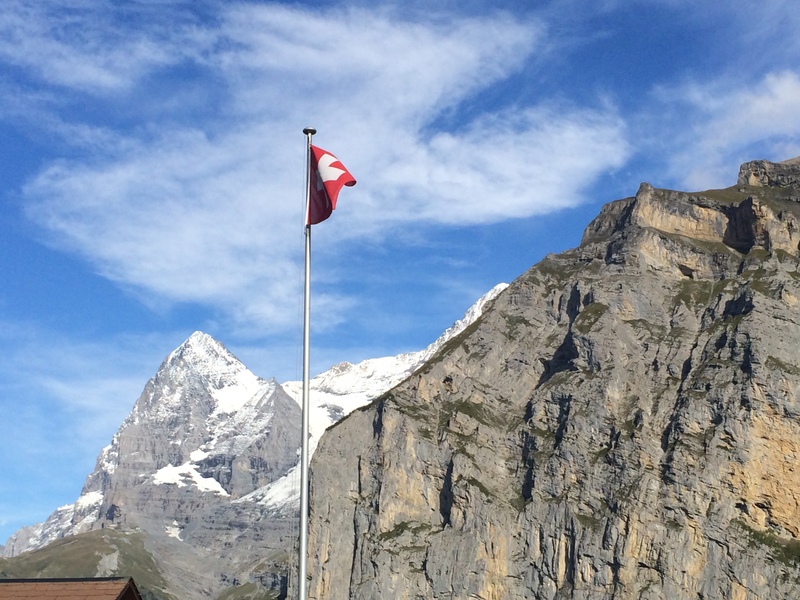 We have just returned from two weeks in Italy, taking full advantage of the Swiss fall school break. While the crowds were far better than in the summer, we were shocked by how many tourists there were. 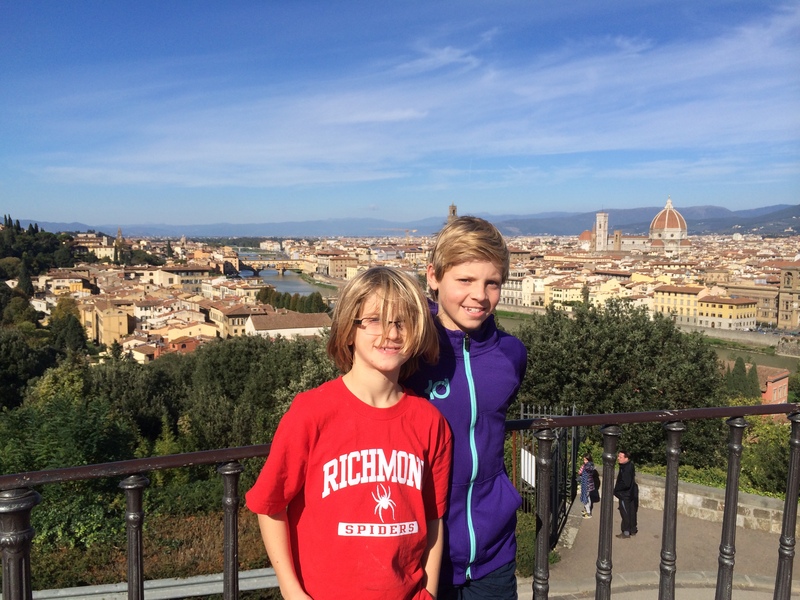 For families with school-age children, it’s hard to avoid “peak times,” and our primary purpose for travel this year is “Europe 101″… making it hard NOT to taking the beaten path along with millions of others. Still, though, a lesson learned for me is to make an extra effort to seek out the less-beaten paths while not sacrificing the “greatest hits.” Advance reservations are absolutely essential in Italy for many museums etc. We had them for the parking lot in (well, just outside) Venice & the Doge’s Palace (Secret Itineraries tour); Gelato Museum in Bologna; Uffizi, Bargello & Accademia in Florence; a winery in Tuscany; and the Vatican and Colosseum & Forum in Rome. All VERY worth it. Note, though, that it is almost always necessary to go to a ticket office nearby to exchange your reservation for paper tickets and then go to the actual entrance (so make sure to ask where that is BEFORE standing in line at the entrance). We did our part to “do as the Romans do,” shifting to a diet of pasta, pizza, great wine and gelato, all in the name of being culturally sensitive. [Ok, to be fair, we did notice that many Italians ate a lot of vegetables too.] I’m sad to say it IS possible to get bad or mediocre food in Italy, but the average is still high, and the excellent is divine. We did learn early on to order a real bottle rather than just the house wine, especially in highly-touristed areas (Venice, Florence). As PapaHatch put it, we should NOT be drinking bad wine in Italy! However, there are EXCELLENT wines that are also really inexpensive – yay! 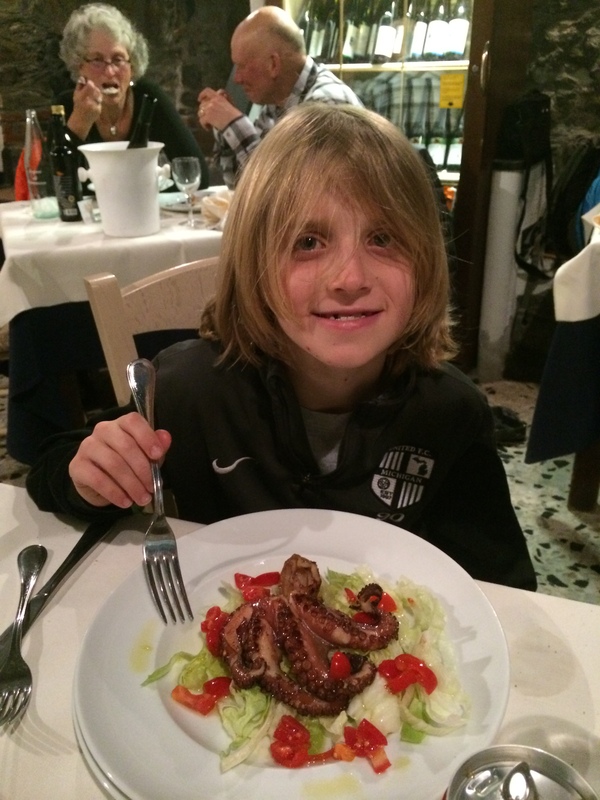 The boys have really amazed me with their adventurous eating… aside from a continued-but-slowly-improving reluctance toward most vegetables, they seem to be attracted to the craziest thing on the menu and eat it with gusto, from snails and frog legs in Paris to wild boar, all kinds of shellfish and octopus in Italy. I am proud and impressed! (and admit that I sometimes can’t even stomach looking at these things myself). They have also come to really enjoy most museums. We have always stocked their bookshelves with books, watched movies and listened to audio books that take place in the destination, giving them an excellent foundation for European art and history. We owe a debt especially to Rick Riordan, author of two series that our boys adore. They both stopped numerous times in front of sculptures or ruins and told me the whole back-story (e.g. “that has to be Juno, because her sacred animal is the peacock… and that has to be Dionysus, because he has grapevines around his head and a leopard around him”). There is an embarrassment of riches when it comes to kid-friendly “backgrounders” for an Italy trip; I will do a separate post on recommendations (but another example is a series called “You Wouldn’t Want to be…” that is silly and fun but actually pretty educational). My point is that with a little bit of prep that is actually fun for the kids, any trip can be enhanced, better appreciated and far more educational. For adults (and kids within earshot), we really enjoyed listening to the Rick Steves podcasts during the drives – his free app with free downloads provided great context for a wide variety of aspects of what we were seeing (culture, food, art, politics, etc.). Some are better than others (of course), and they are of varying lengths, but check them out. We also used the text of his walking tours (also on the app) for several museums and neighborhoods. 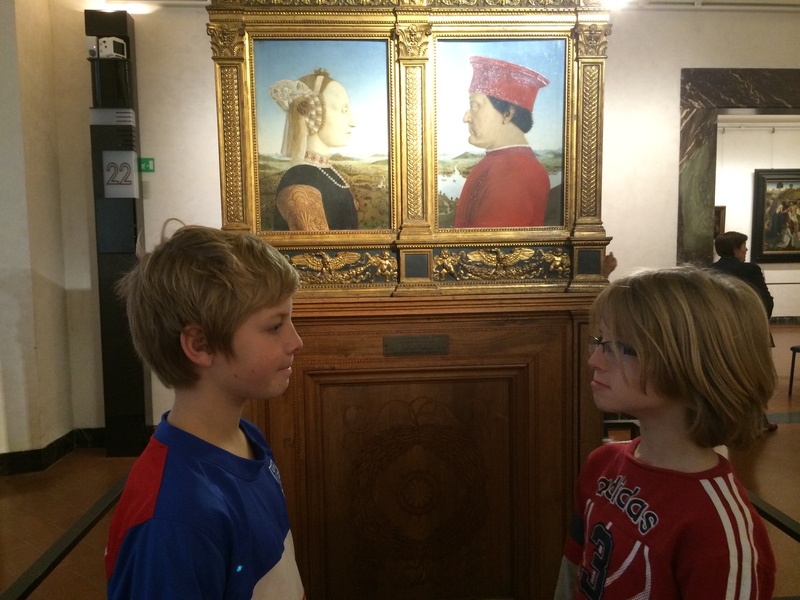 Our kids love posing like the art; another way to engage them in a museum. ARE YOU KIDDING? That’s bad enough, but on Friday at 4pm? Before a Saturday morning departure for a two week trip to another country? Noooooooo! Lucky for me, PapaHatch was much more optimistic than I. 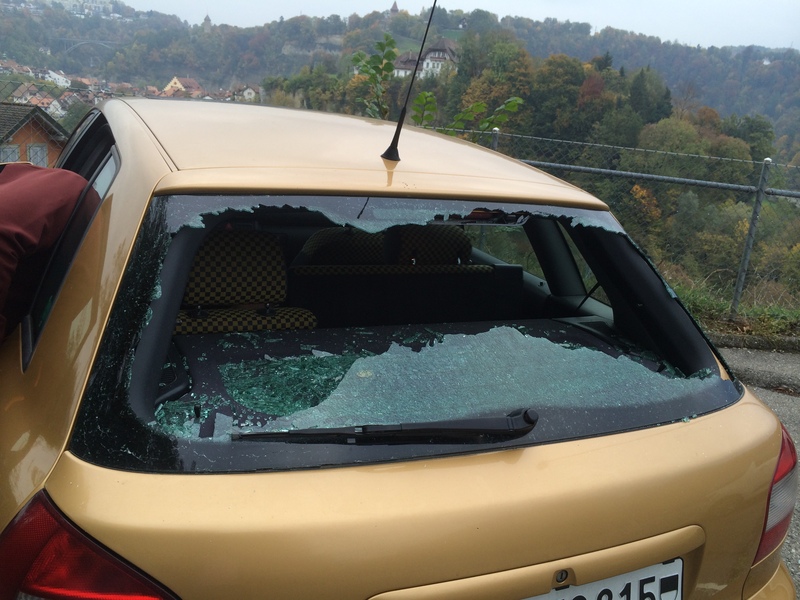 After dealing with the police and several phone calls later, he managed to find a repair shop in Basel that could fix it on a Saturday. Cold wind and broken glass swirled around the boys in the backseat for the hour and 15 minute drive, but a little Swedish meatball lunch at nearby IKEA made everyone feel better. With bodies and cars healthy again, we were able to leave without having to cancel any hotels (thank you, AutoGlass-Basel!). Driving in Italy was better than expected (especially for me, since I was a passenger the whole time! Thanks soooo much, PapaHatch! ), although I guess that may be disproven if/when we get expensive tickets in the mail from automated enforcement. The most difficult thing about driving was the “Zono Traffico Limitado” in most cities and towns. Many are enforced by cameras that take pictures of your license plate and mail you a very expensive ticket, so you want to be sure not to cross the line! If you book a hotel or AirBnB and are driving, be SURE to ask for very specific information about where to park outside the ZTL yet still close to your lodging. City parking signs are not abundant and are confusing. Also, a GPS with European maps is critical. Having a working cell phone to get wifi and – if possible – to make local calls is extremely helpful. We tried to pre-arrange dinner reservations almost every night, and we really regretted it when we didn’t have them. My cell phone failed me at making local phone calls for some reason, but I was able to make calls from my Skype app when I was connected to wifi. One challenge with AirBnB is communicating with the local host re: arrival time and getting the keys. We managed it, but just barely sometimes, which did add a tiny bit of stress. Overall, I was very pleased with our itinerary. We had a great balance of city, countryside, things we needed tickets to and more relaxed unplanned wanderings. We had excellent luck with lodgings, particularly the AirBnBs. We set a lodging budget of an average of $150/night, and we came in at $146, with four days that included breakfast and the rest we were able to make ourselves in the room/apartment. I realize that this budget is not within everyone’s reach, but for a family of four in notoriously expensive places like Rome and Venice, we found the rental apartment route far better value than hotels. I know AirBnB is not everyone’s favorite company, but it has really opened up the possibilities for the more frugal traveler. European hotel rooms are notoriously small and often can’t even accommodate two adults and two kids in one room, and being able to get and keep/refrigerate coffee, milk, bread and yogurt to eat in the mornings is liberating. By “average” expense, I mean just that – Rome was indeed quite a bit more expensive, but the apartment was really nice, conveniently located and in a really cool and interesting neighborhood. Tuscan hill country was much less expensive, so it balanced out. Word to the wise in Italy: it’s very easy to overload electrical systems, so don’t use a hairdryer if any other appliances are on (including a standing floor fan! )… I did this in two different apartments. Speaking of which, having access to a washing machine during a two week trip with two um, energetic boys was really helpful. The only challenge is that no Italians have dryers, so you have to plan accordingly (i.e. putting in a load at the beginning of a three day stay). We found Italians were friendlier as we moved south and/or away from the hordes of tourists. We also got much better treatment when we attempted to speak even a little Italian (even asking “parla inglese?” goes over better than “do you speak English?”). Even so, while doing our part to try to undue negative stereotypes of tourists, we also gently sent back a bottle of wine that was NOT the better one we asked for and knew we’d get billed for. Interesting stuff MamaHatch!!! Guess you can’t have the ‘ventures’ part of adventures without a few bouts of food poisoning and smashed car windows!! You’re a warrior! Yes, misadventures are to be expected, and I guess make me appreciate when things go well??? 😊 It’s good to be reminded that rolling with the punches is better than getting KO’d.